The stability of America’s status quo is illusory. One of the enduring mysteries of the past decade is why inflation has remained tame while the central bank and government have pumped trillions of dollars of newly created money into the economy. Millions of words have been written about this, and so some shortcuts will have to be taken to make sense of it in one essay. 1. Adding newly created money but not generating new goods and services of the same value reduces the purchasing power of existing money. To keep it simple: say the economy of a country is $20 trillion. (Hey, the US GDP is $20 trillion…) Say its money supply is $10 trillion. So banks and/or the government create $2 trillion in new money but the value of goods and services only expands by $1 trillion. the “extra” $1 trillion of newly created money (either “printed” or borrowed into existence) reduces the value of all existing money. In effect, the new money robs purchasing power from all existing money.Those holding existing money have lost purchasing power while the recipients of the new money receive purchasing power they didn’t have prior to receiving the new money. 2. Where “inflation” (higher prices for the same item) shows up depends on who gets the newly created money: the wealthy few or the wage-earning many. As I have explained many times, in our system, all newly issued money goes to banks, financiers and corporations–the super-wealthy few. So what do already-wealthy people and companies do with trillions in new money? They buy assets–stocks and bonds and real estate. Wage earners who receive new money tend to save some of it but they also spend some of it. The super-wealthy and corporations already own more stuff than they know what to do with, so they spend the new money on income producing assets or stock buybacks. The net result of giving all the new money to the wealthy is the inflation of an asset bubble, which is precisely what’s happened in the past decade. Real estate: bubble. Corporate debt: bubble. Stocks: bubble. 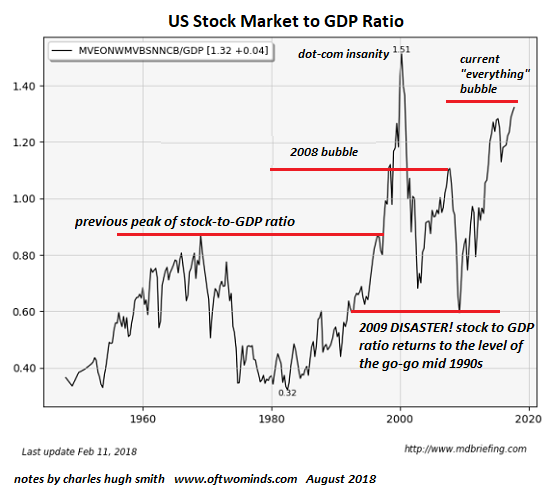 We can see this bubble by comparing the value of the stock market to the real economy (as measured by GDP): the higher the ratio of stocks to GDP, the greater the bubble. Look at the chart below. The current stock market bubble is the greatest in history, exceeded only by the insanity of the last few months of the dot-com bubble, when companies with very little revenue and zero profits were valued in the billions of dollars. Stocks are in a bubble, period. This is the inevitable result of shoveling all the new money into the hands of the wealthy and corporations. Real-world inflation is certainly higher than official inflation, but the real inflation (higher prices for the same item) is in assets, which have tripled or quadrupled in a mere decade. 3. The inevitable consequence of asset inflation is rising income and wealth inequality. The wealthy few have gorged on assets with all the newly issued credit-money, and as the assets soared in value, they’ve become immensely wealthier. A funny thing happens on the way to extremes of wealth/income inequality: social unrest, disorder, revolt. The lackeys and apologists that serve the interests of the wealthy few label this “populism,” but it’s really just the inevitable response to extremes of wealth/income inequality generated by funneling trillions in new credit-money to the wealthy few at the expense of wage-earners and holders of existing money. 4. To quell the revolt of the many, the Powers That Be will create trillions in new money and helicopter-drop it to the masses. This mass distribution of newly created money (borrowed into existence by the central bank and/or government) will flow into the real-world economy, not assets, and so the inflation (higher prices for the same item) will manifest in good and services. This helicopter drop of newly created money will be called pensions, Universal Basic Income, tax subsidies, negative tax rates, etc. There are a lot of names for distributing newly created money that’s been borrowed into existence. This is precisely what Venezuela has been doing for a decade: distributing newly created money that isn’t matched by a corresponding increase in the production of goods and services. And as we know, the result of this has been the complete destruction of the purchasing power of Venezuela’s money. “That can’t happen here” is just what the Venezuelans thought five years ago.But really, it boils down to math: creating money out of thin air and pumping it into a dysfunctional economy destroys the purchasing power of the existing money. Those receiving the new money are like a snake eating its own tail. They know this generates inflation, but the increases in the value of their assets have always far outstripped real-world inflation, so they don’t care about inflation. That’s for little people to worry about. But what the wealthy few are forgetting is rip-roaring inflation destroys the system just as surely as wealth/income inequality. Just ask the Venezuelans how effective creating new money has been in terms of eliminating poverty: now their entire populace is impoverished, with the only exceptions being the wealthy few in control of the status quo. The stability of America’s status quo is illusory.Can’t happen here is going to ring mighty hollow in five years. Nothing to see here, move along. 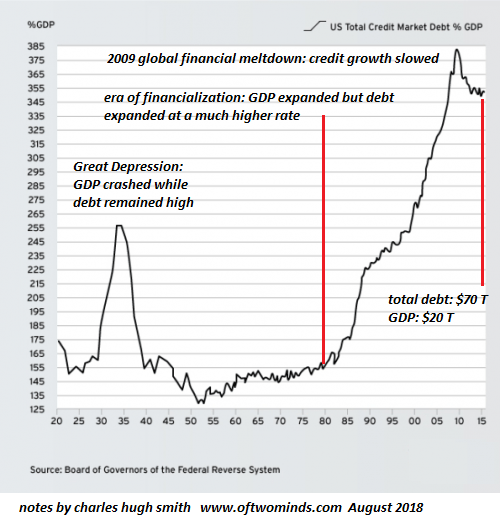 So what if debt has blown past GDP? Rising stock valuations are good for America–or at least good for the few who own most of the stocks. Never mind this is the second-greatest bubble in history; stocks can never go down, volatility is low, the Fed has our backs, profits have never been higher, etc.